Over six years ago, people of faith convened around an issue facing countless families in the New Orleans community — homelessness. The growing number of people experiencing homelessness increased to 70 percent after Hurricane Katrina. The number of places used to house families in crisis were few compared to the need. After hours of meeting with already existing providers, conducting research around the need and endless hours of consultation, Sisters Mary Lou Specha and Julie Marsh launched Hotel Hope. 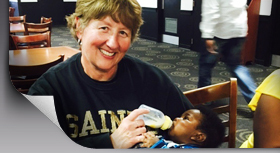 Presently Sister Mary Lou serves as executive director and Sister Julie as director of operations. Hotel Hope, a nonprofit, interfaith organization, provides emergency shelter for women with children in need of housing, a safe and loving atmosphere and related supportive services. Hotel Hope collaborates with local community services and resources to offer women as well as their children an opportunity to reach their full potential, in hope of creating an environment that will benefit the local neighborhood. Their vision is clear. Their motivation is the passion for the mission. Learn more about the Hotel Hope ministry.